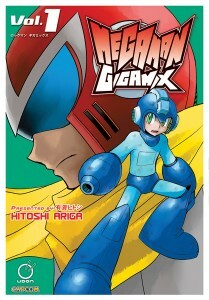 Rockman Corner: Mega Man Gigamix Delayed? In what may not come as a surprise to some, it appears there's a very good possibility Mega Man Gigamix volume 1 will be delayed. While Udon Entertainment haven't announced it as official, Amazon is apparently sending notification out to customers the book will arrive from anywhere between July 18 to July 22. Reader Tony P., who pre-ordered the book some time ago, received word this morning. Currently, no other retailers have reported the delay. Amazon, however, is usually the first to strike followed by an official confirmation from Udon. Gigamix vol. 1 was originally due out for release this month, May 17. As a consequence, the delay may hinder the release dates of Gigamix vol. 2 (August) and vol. 3 (September), pushing those books a month forward, a pattern that affected all three Megamix books some time ago. Not a huge surprise, but still a little disheartening if you were expecting Gigamix in your mailbox a few weeks from now. We'll keep an ear out for future updates! I, for one, am kinda glad for the delay. Means I can save up my money for something else I wanted, a very expensive hardcover art book. Show of hands, who's actually surprised? I can't see how anyone could possibly be surprised by this. Seriously, how many Megaman releases have to be delayed before Udon actually DOES something about it? It's absolutely shameful, and they obviously don't care that they keep stringing the fans along with their "release dates" that never come to pass the first time around. Better late than never. Not only Udon is translating it, but if they are delaying it instead of releasing the manga as it is means they are taking care to make sure everything is alright. They're the ones having to wait for Capcom's approval. Or it could be that Amazon made a fail guess themselves. If you're looking to blame anyone, blame Capcom. Or Amazon. Honestly, I'm sick and tired of hearing all of this stupid complaining over delays. It's almost like the constant MM2 debates. Sure I'm not one bit surprised by it either, but I at least understand the reasons of delays and don't mind them. Nawwww, I'm not surprised. I pre-ordered Gigamix Volume 1 back in February, but waiting never killed me. Amazon listed it as available in June, and then I had a feeling mid-May was a bit early. Now it actually does show that it's coming in July instead. If UDON is always unsure if their product is going to be released on a certain date, then would it not make sense for them NOT to give the fans a set release date in the first place? Wait until everything is finalized and good to go, THEN announce a release date. And yes, UDON is the one who announced the release date for Gigamix. Check their website if you need proof. The self-righteous bitching and moaning, or the self-righteous bitching and moaning ABOUT the bitching and moaning. It's still not their fault that they have to wait endlessly for Capcom's approval. Udon is still to blame for announcing release dates before actually getting approval, though. Delay? thats ok we can wait, maybe there adding some special features that is not available in the other ver. may me thinks..